Home » Reviews » Lexip’s 3D Mouse with 2 Joysticks – Failing in “Too” Many Ways! Lexip’s 3D Mouse with 2 Joysticks – Failing in “Too” Many Ways! For couple of weeks, I have been switching between Razer Hex and Lexips 2 Joystick gaming mouse (aka Lexips 4d or 3d Mouse) which is seeking funding now on the Kickstarter. Here we will discuss why this gaming mouse is only going to flop due to its bad user experience. Gamers across the globe are more obsess over getting more control. Higher refresh rates, more responsive keyboards, reduced lag and gaming mouse clicks with higher DPI. However what about if they need more precise movement? There is a mouse known as Lexip that purports for being one of the most precise and versatile gaming mouse ever, stated by its Kickstarter page. After using it for dozens of hours and discussing it with other gamers, I am still trying to figure out the point of this as a gaming mouse that only comes with harsh tradeoffs however seems to have been abandoned by manufacturer. I just can’t suggest it for many reasons. It offers +/- 20 degrees in vertical as well as horizontal movements, however base actually turns right and left also. The manufacturer also say that this mouse can register more than 300,000 positions of its joystick to its internal processing unit. The other joystick is on a side where your thumb rests. The issue with having mouse rest on pivoting platform is that it moves as you click. Right click, it moves, left click it moves in other direction. So it does not stop rocking and pivoting around. When you like to move it as an entire joystick, you cannot do it without accidentally pressing right and left mouse buttons until you move your fingers frontward and rest them on mouse frontal part. Annoying! It could be that my hands are just screwed up from a couple of decades of guitar play, gaming, and blogging, but no other activities or controllers hurt my hand and wrists like this. It would be remiss of me to not mention it. The front part of mouse is yet another issue. It takes up lots of area where user’s fingers expect mouse button to be. Therefore unless you are a claw grip user, you aren’t clicking anything. It can be seen why this mouse has a lot of nonfunctioning space ahead of buttons, making them shorter, as normal hand positions may become barrier for the mouse selling point. If you are gonna position your mouse as an FPS gaming mouse, then alteast don’t use ADNS-9800 sensor. The sensor is not all bad, however why would you for an old sensor with recorded issues when there are lots more better option available? The ADNS 9800 has known lag or acceleration issues. Plus it falls under cheap sensor class. So why would anyone pay $149 when you can buy a good optical mouse with Pixart PMW 3310 or 3360 in the same price. For instance you can have ROCCAT Kone AIMO or Razer Naga Trinity under $150 which offers better specs and overall performance. You need to put much more force to register your clicks, because the right and left paddles are much stiffer. So if you are after good response rate, you should look for something else. It lacks versatility as compared to other mice, such as Microsoft Surface and Razer’s Hex, both can be used on wood desk without any hurdles. In contrast, Lexips need a mouse mat that is a bit of problems. The biggest frustration is its configuration panel that is buggy and ugly as compared to others. Although it can be expected to be improved with time, however it will never reach the level of Razer Synapse software. There are 2 side thumb buttons, however they are positioned awkwardly because of the thumb sticks. Users complained they need to mover their thumb back a lot in order to click rear side button. I tried to click this rear button, and I found that I need to twist my thumb as if I am thumb wrestling with my mouse. After short period of use i.e. around an hour or less squeezing my hand to mouse grip and twisting my wrist for activating tilts, if felt my thumb and wrist joints hurting. Forward tilt action makes middle click harder that makes whole mouse feels confused because all the different parts are fighting for their positions. You will never understand why to use this gaming mouse over gamepad, mouse or keyboard setup or over a real flight stick. In general its use is more annoying than its worth. I suppose there should be a use-case for all these additional controls. Pivot could be worthy in 3D modeling, for instance, however I have not had an opportunity to try the mouse for that use. 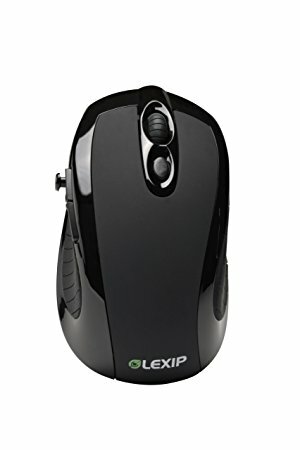 The matter of the fact is, Lexip bills their new mouse for gamers especially FPS. However I can’t imagine why one would like to scarify precision to jerk mouse around. In tilt position it’s impossible not judge the cursor around that is more unintuitive. Although it still need a test for gaming purpose, however at first touch I cannot imagine these extra forms of mouse control can outweigh the way it feels functionally. With a price tag of $150, we think Lexip 3D Mouse is simply not worth it as there are more options available in this price range with overall better features and performance. I like how this article isn’t trying to play an FPS with the joystick or something. Most of the reviews have just the weirdest choices of gameplay, like they had no idea what they’d do with it before getting it. Only one I saw had the mouse being used to tilt a helicopter in GTAV, which seems to me the most obvious boon the mouse might provide, freeing the hand from the numpad/arrow keys in such games and giving us room to engage in freelook.